Can a film achieve one aspect of its production to near flawless quality and still wind up being a misfire? After seeing the WNUF HALLOWEEN SPECIAL, I’m afraid the answer is yes. If you pop this film into your DVD player, or better yet your VCR, it will have all the appearances of something that was taped off of WNUF, UHF channel 28 on October 31, 1987. You’ll see the nightly news, complete with local commercials, followed by a Halloween special that ends in disaster. The only thing is that there is no WNUF. The news segments, commercials and the special are all very convincing fakes. First, we sit through the evening news, which is mostly a waste of time. We see a few news stories that create some local ambiance and provide a couple of clues. But it all goes on a bit too long, and isn’t aided by the male newscaster, who turns in one of the film’s few hammy performances. It should be noted however, that everything looks exactly like a local newscast from 1987. You’ll have to look hard to spot anachronisms that take you out of the illusion. For instance, one protest sign in a story about anti-Halloween crusaders reads, “Orange is the new black.” Also, several names are homages to people in the horror and SOV fields. According an article appearing in Vice (helpfully quoted on Wikipedia – Come on, I’m not doing THAT much research.) director Chris LaMartina never expected people to fall for the scam anyway, but wanted to make it as convincing as possible for pure nostalgia’s sake. And in this, he succeeds to a shockingly profound degree. Another highlight of the film are all the local commercials, all faked, though some are based on genuine products and businesses of the time. Who else remembers those pumpkin carving kits that promised to make it easy and fun without sharp edges? It’s here and it brought back such vivid memories, I had to double-check they didn’t acquire the real deal. I say “they,” because while LaMartina directs some of the commercials, he couldn’t have realistically shot all of them without spending several years on the project. So, we have help from other talented people in the indie field, contributing to everything from ads for fake movies, carpet outlets and strip clubs. 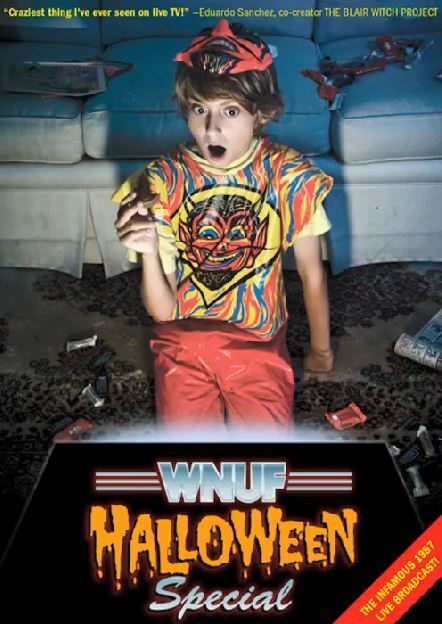 It’s in these moments that the WNUF HALLOWEEN SPECIAL really shines. But let’s not forget that what we’re watching is actually a horror film, even if it is one whose tongue is planted firmly in cheek. Once the actual Halloween Special proper starts, it promises on scares that it never delivers. This is the section of the film where newscaster Frank Stewart (Paul Fahrenkopf) takes his camera crew on a tour through a house that was the site of a series of horrific murders twenty years prior. He brings a husband and wife team of spiritualists, most likely based on Ed and Lorraine Warren, along to contact any restless spirits. Just to dot all the i’s and cross all the t’s, Stewart has also brought in a priest, though the Father seems extremely reluctant to perform an exorcism, despite increased prodding. It doesn’t take long for things to go wrong and the whole thing continues to take on the appearance of a show that would make Al Capone’s empty vaults seem like a happy ending in comparison. But while this may have all the appearances of a Halloween special, it doesn’t make for a very effective one. The pacing and the lame attempts at humor kill any suspense and it’s hard to believe that I would have cared what would have happened in 1987 any more than I did now, even when the bodies started piling up. There are still cuts to commercials in the supposedly live broadcast, especially when they are moving to a new section of the house or when something seems to be going wrong. And in the film’s most telling aspects, the commercials are more entertaining than the special itself. But even the fake anti-drug PSAs and their ilk become a bore. After all, this film is over eighty minutes long and the local charm is enough to support the WNUF HALLOWEEN SPECIAL for maybe half that. What we have is a film that’s a charming trip down Memory Lane, at least in small doses. Almost all of the actors give it their all. But LaMartina’s film winds up being one that is exceedingly successful at its gimmick, but drops the ball when it comes to telling an interesting story. Awful. The protestor’s sign actually reads, “Orange & Black = the Flames of Hell”. Sorry, the movie wasn’t for you. We made it for a very specific audience and clearly you’re not one of those folks. Regardless, have a happy Halloween. I stand corrected on the sign, my bad. And thanks for understanding. Like I said, a lot of it I felt was handled great and looking at most of the reactions from the community, I’m clearly in the minority. I look forward to seeing what you have in store next. Hope you had a great Halloween. Next Next post: HAPPY HALLOWEEN! What Are the Best Films to Watch On the Holiday?